The Catholic School Board of Toronto has been lobbying councillors and staff to exempt them from the green roof requirement of the By-law for nine new projects, arguing instead that they be allowed to install white or reflective roofs and hold 5mm of rain rather than a green roof. This is the same argument used by the industrial sector to exempt them from the Green Roof By-Law, for the second time since the By-Law was introduced. While the green roof By-law remained relatively unscathed so far under the current Mayor Ford’s ideologically-conservative cost-cutting measures, the political climate has been tense and divisive and has focused on trying to preserve existing social services and environmental measures from cuts, rather than city-building and looking forward. This means that it is unlikely that there will be any expansion of the green roof By-law, or any environmental initiative, under the current political leadership. Developers are concerned about the new green roof requirements just passed by the City of Toronto in May 2009. Part of their concern is that the green roof requirement will force them to forgo other green options. They are also concerned about the increasing height of many Toronto office and residential towers and the fact that green roofs have not been tried on structures that high. What is interesting is that Toronto, unlike Chicago, is the first city to mandate green roofs for ALL new large project buildings (though Chicago was able to mandate green roofs for buildings which they contributed funds towards or which needed public approval). For the full story, click here. 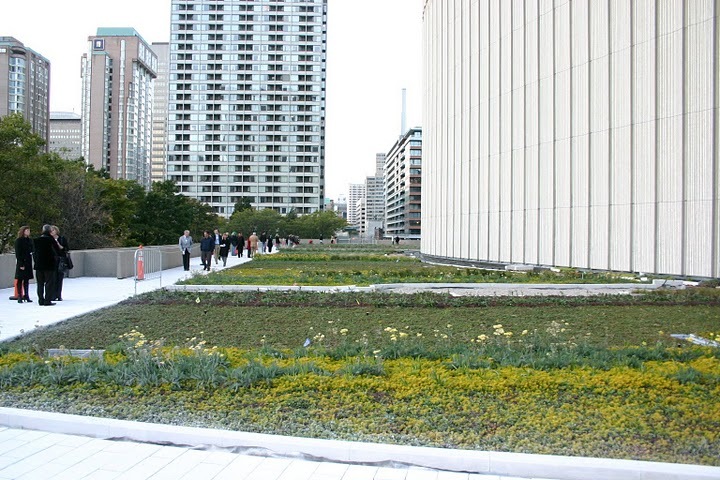 In May 2009 Toronto became the first city in North America to require green roofs on all major new developments. Though in the works for three years, the new green roof being constructed at the Eglinton West subway station will be the first green roof on top of a subway. Constructed by Gardens in the Sky Inc, the green roof is visible from the Allen road expressway, which is a heavily-used north-south artery from the 401 highway. The green roof will be a 9,000 square foot garden constructed from sedum plants in removable trays. In addition to improving the aesthetic value of the area, the green roof will encourage bird and insect life and reduce heat in this heavily-used traffic corridor, according to Terry McGlade, president of Gardens in the Sky, Inc. The roof will cost about $25-$30 more per square foot than a traditional roof. New York City has garnered international attention with its recent opening of the Highline park, which is a new public greenspace on an abandoned elevated rail line. The ‘park’ has a long history and is a testament to community organization and new, innovative visions for urban revitatalization and urban greening. The park has used a naturalized aesthetic to replicate the abandoned character of the line and encourage native habitat. For more information and pictures, click here. Toronto has just passed the most comprehensive rules on green roof implementation of any city in North America, making green roofs mandatory on most new buildings starting in 2010. For the full article, click here. The growth of the green roof industry in North America has grown by 35% in the last year. Chicago is still in the lead, with over 548,000 square feet installed in 2008, while Toronto has just passed legislation requiring a 50% coverage of the area of all new green roofs to be covered with greenery. For the full article click here. New proposed legislation would provide financial incentives for commercial and household green roof installationin the US. Senator Maria Cantwell from Washington State introduced the Clean Energy Stimulus and Investment Assurance Act of 2009 (S.320) January 26th. Section 506 of the bill, which would provide residential and commercial property owners with a 30% tax credit for qualified green roof expenditures, was written in collaboration with Green Roof for Healthy Cities and the American Society of Landscape Architects. The bill would apply to both new and retrofit projects and would require at least 50% of the roof to be covered with a green roof. For more information, click here. State legislation passed in June 2008 allows New York City building owners who install vegetation on at least half their buildings’ available rooftop space to offset $4.50 in property taxes for each square foot of green roof they install, for one year. The credit covers about a quarter of the cost of installation and is capped at $100,000. To see the full article in the current GreenSource, please click here: New York Green Roofs.